When I was a Girl Scout, working towards my Silver Award, I struggled with the idea of what was a good “Silver Award Project”. Some of my friends wanted to work in a group and volunteer our time at a local animal shelter. We all thought this was a great idea, but with direction from our Girl Scout Leader, we learned that just volunteering our time was not a Take Action Project. With guidance, we learned the difference between Community Service and Taking Action. 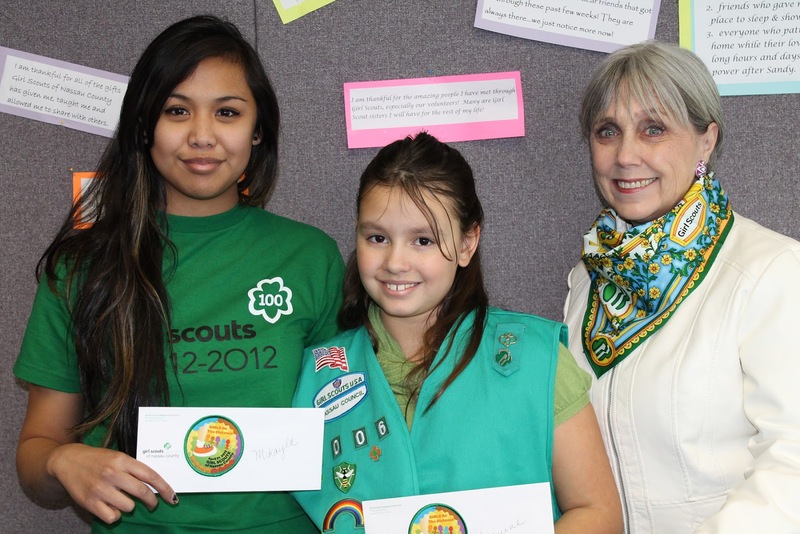 - Cassie R.
Learn what the difference is between a Take Action Project and a Community Service Project in Girl Scouting. Click for some great examples Gold, Silver, or Bronze Award Projects from GSUSA’s Map It. When you complete your Take Action Project, don’t forget to share. Still have questions about the difference between a Take Action Project and a Community Service Project, try attending one of Girl Scouts of Nassau County’s Take Action for Silver or Take Action for Gold workshops (depending on which award you are working towards earning). The Complete Outfit Girl Scout Uniform Series Puts all the Individual Pieces Together into an Entire Girl Scout Senior Ensemble! Girl Scouts don’t have to wear just a vest or sash with the insignia to show their Girl Scout Pride! There are other options available, for example, wearing the GS Service mark T-Shirt in Green or toting the Year of the Girl Tote in black. Both items can be worn or used as part of your everyday attire. Here are the Top 10 important pieces which will provide your Girl Scout with the complete “Senior Look”. Visit Girl Scouts of Nassau County’s Blog again next Tuesday for the “The Complete Outfit Series: Girl Scout Ambassador”. The excitement builds for the 2013 Girls Go The Distance Walkathon and Activity Fair as the Winners of the Girls Go The Distance Patch Contest are presented their Patch! Last Friday, I had the pleasure of presenting the winners of the Girls Go The Distance patch design contest, with their commemorative patch. Mikayla B from Senior Troop 3077 and Katherine P from Junior Troop 3006 and their families joined me at the GSNC Service Center to be the first to receive the 2013 Girls Go The Distance Walkthon Participation Patch. The patch, designed with the 6 Girl Scout level colors, was a combination of two different patch designs, refined into one patch. The patch features 6 girls in the 6 different colors walking and running over green hills with a bright sun in the background. In the foreground of the patch, we see the leg and sneaker of a new walk participant, possibly there to join in the fun of the walk. The patch also features this year’s name of the event, date and location. Doesn’t it look great? The Complete Outfit Girl Scout Uniform Series Puts all the Individual Pieces Together into an Entire Girl Scout Cadette Ensemble! Have you been wondering what uniform components your Cadette Girl Scout should have? 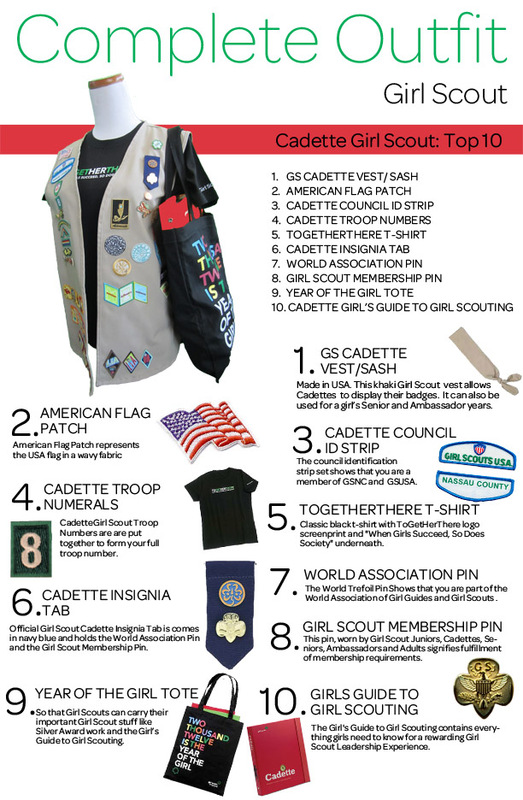 Well, GSNC has decided to break down the uniform into the Top 10 important uniform pieces which will provide your Girl Scout with the complete “Cadette Look”. 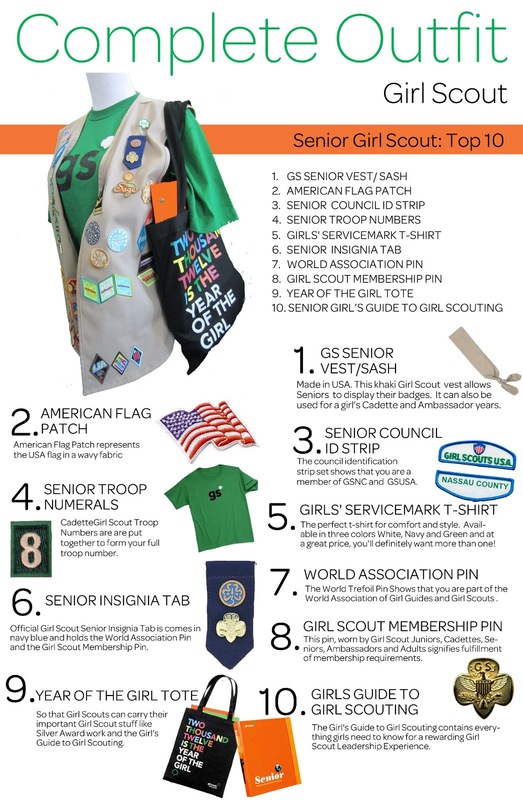 Visit Girl Scouts of Nassau County’s Blog again next Tuesday for the The Complete Outfit Series: Girl Scout Senior. 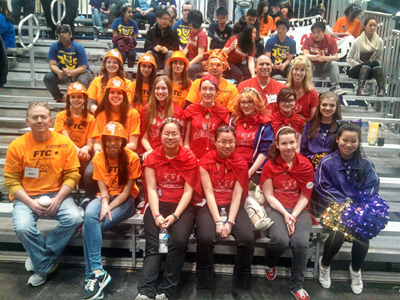 Congratulations to Girl Scouts of Nassau County's FLL and FTC Teams on their Successful 2013 Robotics Season! It’s that time of the year…. our Robotics season has come to a close. But there is no reason to be sad, because Girl Scouts of Nassau County gets to celebrate the amazing accomplishments of our Robotics Teams and look towards the future of Robotics in Nassau County. We have the opportunity to share the world of STEM with many new faces and young minds. All of our FLL and FTC teams, with help from their coaches and mentors, had an amazing season! Girl Scouts of Nassau County’s seven FIRST LEGO League (FLL) teams, competed in the Student Business Partnership of Long Island's (SBPLI) 9th Annual FLL Qualifying Tournament. Of the seven, six teams won awards and moved on to the SBPLI Championship Tournament! At the SBPLI Championship Tournament, two GSNC teams won awards. Merrick Masters :) won 1st Place for STRATEGY & INNOVATION! Smart Cookies won the INNOVATIVE SOLUTION Award! Girl Scouts of Nassau County’s FIRST TECH Challenge (FTC) teams—the IceBreakers, LEGOtronettes, and Bot Masters (Bot Masters is a Girl Scout/Boy Scout team) had fun competing at several tournaments this season including the Jacob Javits (NYC) FTC tournament, where the IceBreakers won the THINK Award! 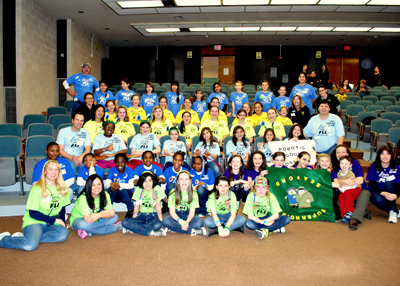 We congratulate ALL of the Girl Scouts of Nassau County FLL and FTC teams who won awards! We thank FLL teams Digital Darlings, LEGO Chicks, Seaford Supernovas, Zion Innovators, Robot Cookie Monsters, Merrick Masters :) and Smart Cookies and FTC teams IceBreakers, LEGOtronettes and Bot Masters for their hard work, perseverance and for representing Girl Scouts of Nassau County with courage, confidence and character! We are very proud of all of our Robotics Teams!! Girl Scouts of Nassau County is dedicated to promoting girl's interest in STEM for girls in grades Kindergarten - 12! If you like to build or design things, do research or have an interest in communications, acting, science, technology, engineering or math then this may just be the program for YOU! The girls on our robotic teams do more than just build robots, they do all of the above and have a lot of FUN while doing it! We invite any girl who is interested in joining a GSNC Robotics team to our Open House on Thursday, April 18, 2013. Please, go to the GSNC website, www.gsnc.org and click on “Programs & Events” to reserve your spot! Contact Patty Donohue-Brown at brownp@gsnc.org with questions.